Accessories: Accompanied by Patek Philippe Certificate of Origin and fitted presentation box. Furthermore delivered with Patek Philippe Extract from the Archives confirming production of the present watch in 1926 with Breguet numerals and its subsequent sale on November 11, 1929. Furthermore accompanied by unsigned associated gold chain. This yellow gold openface chronograph watch is an incredible relic of time. 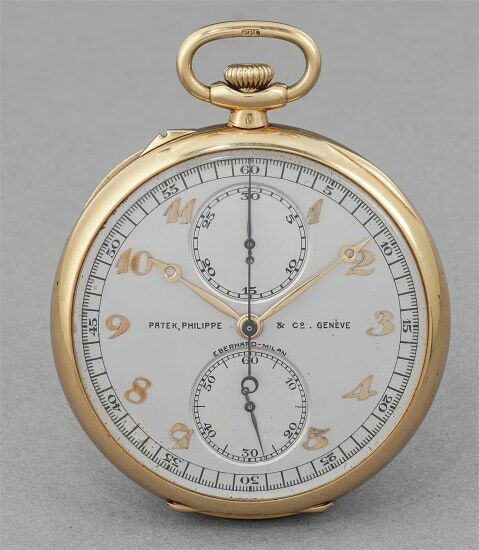 Extremely well-preserved, it displays Breguet numerals and vertical registers, both of which are confirmed by the Patek Philippe Extract from the Archives. Furthermore, it displays the signature of Eberhard-Milan above the subsidiary register at 6 o'clock. Most notably, the cuvette is also stamped "Fabrication Spéciale Pour L'Horlogerie Eberhard-Milan", indicating that this watch was specially made for the famed and storied Italian retailer. As an added layer of collectibility, this timepiece is accompanied by its Certificate of Origin and presentation box. It is offered in excellent condition with a crisp hallmark punched on the bow. The "PPC" stamp is crisp and immediately visible.